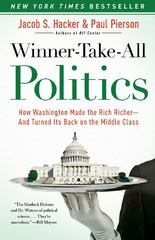 Winner-Take-All Politics 0 Edition A groundbreaking work that identifies the real culprit behind one of the great economic crimes of our time— the growing inequality of incomes between the vast majority of Americans and the richest of the rich. We all know that the very rich have gotten a lot richer these past few decades while most Americans haven’t. In fact, the exorbitantly paid have continued to thrive during the current economic crisis, even as the rest of Americans have continued to fall behind. Why do the “haveit- alls” have so much more? And how have they managed to restructure the economy to reap the lion’s share of the gains and shift the costs of their new economic playground downward, tearing new holes in the safety net and saddling all of us with increased debt and risk? Lots of so-called experts claim to have solved this great mystery, but no one has really gotten to the bottom of it—until now. In their lively and provocative Winner-Take-All Politics, renowned political scientists Jacob S. Hacker and Paul Pierson demonstrate convincingly that the usual suspects—foreign trade and financial globalization, technological changes in the workplace, increased education at the top—are largely innocent of the charges against them. Instead, they indict an unlikely suspect and take us on an entertaining tour of the mountain of evidence against the culprit. The guilty party is American politics. Runaway inequality and the present economic crisis reflect what government has done to aid the rich and what it has not done to safeguard the interests of the middle class. The winner-take-all economy is primarily a result of winner-take-all politics. In an innovative historical departure, Hacker and Pierson trace the rise of the winner-take-all economy back to the late 1970s when, under a Democratic president and a Democratic Congress, a major transformation of American politics occurred. With big business and conservative ideologues organizing themselves to undo the regulations and progressive tax policies that had helped ensure a fair distribution of economic rewards, deregulation got under way, taxes were cut for the wealthiest, and business decisively defeated labor in Washington. And this transformation continued under Reagan and the Bushes as well as under Clinton, with both parties catering to the interests of those at the very top. Hacker and Pierson’s gripping narration of the epic battles waged during President Obama’s first two years in office reveals an unpleasant but catalyzing truth: winner-take-all politics, while under challenge, is still very much with us. Winner-Take-All Politics—part revelatory history, part political analysis, part intellectual journey— shows how a political system that traditionally has been responsive to the interests of the middle class has been hijacked by the superrich. In doing so, it not only changes how we think about American politics, but also points the way to rebuilding a democracy that serves the interests of the many rather than just those of the wealthy few.